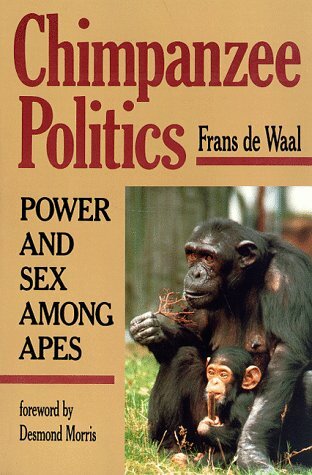 Chimpanzee Politics is one of the most mind-expanding books on human behavior that I’ve ever read. Imagine looking into a magic mirror that reflects your visible and invisible reflections. I constantly had that feeling when devouring this detailed, scientific and thoroughly engaging book: As de Waal describes (I paraphrase), chimps are more human than human because we humans can see them with less bias than we have when trying to see ourselves. I am interested in individual behavior within the context of social groups for personal and professional reasons. Personally, I have worked and studied in several countries and many diverse regions of the U.S., beginning from an early age, so I became painfully aware of my ignorance of social norms and I learned how to manage my interactions in groups. Chimpanzee Politics reveals in practical relatable terms how important social life is to primates and how painful and frightening group members feel when they are not accepted, or worse, ostracized or harassed. Professionally, I conduct ethnographic research of social media, so I study groups of people in social media venues in which my clients have high interest, and I mentor teams on how to interact in order to build trust and relationships. So behavior in groups is my stock-in-trade. Have you ever wondered why “politics” became a dirty word? Or what politics really is? This book unmasks what most people mean when they use “politics” and probably how you hear it, but I’ll wager that you’ve never really thought about why people hate “politics” so much, why they think it dirty. From a practical perspective, this book will help you clarify your feelings about “politics” so you can experience it in a more rewarding way. And I would be completely remiss if I didn’t mention the book’s superb photos, which serve to bring the characters to life. I doubt that you will be surprised that Chimpanzees, like most primates, are patriarchies in that one male dominates the community and uses his power to have preferential mating privileges, so the power take-overs detail how the reigning male, Yeroen, became challenged by Luit (take-over #1) who was subsequently deposed by Nikkie (take-over #2). But there are incredible subtleties that have practical lessons for human politics: these three males dominated the community, but their shifting support for each other was highly conditional on the situation (like “politics”), and back-stabbing is rife. If you’ve practiced politics in your community or you’ve had corporate or government jobs, you’ll see patterns you’ll recognize. Moreover, the females are no pushovers! In fact, when the story opens, there is no mature male in the community, so “Mama” is the Elizabeth I of the group. And when Yeroen arrives, there’s an extended period of adjustment during which he has to pay his dues to Mama and other senior females before he can establish himself as the alpha male. Also notable is the unique role of Puist, a female who refuses to mate and exhibits lesbian behavior. She plays a unique mediation role between males and females. De Waal’s teams spent years counting the community members’ social actions (much as I do when I conduct ethnographic research of social media) and the context in which they occurred. That’s a key part of the uniqueness of the studies he references throughout the book. In the wild, it’s impossible to count individuals’ social actions since most are unobserved. The Arnhem community, however, is a kind of closed system; it’s a relatively large habitat, but its observation tower enables human researchers to count virtually every social action. Therefore, teams compiled data on how each member curries favor with each other member, how coalitions and alliances worked (“you scratch my back, I’ll scratch yours”; Luit depended on Nikkie, his junior, for support in dethroning Yeroen), and the supporting processes that went into each power shift. The main currencies of relationship are grooming, supporting one’s alliance partners in their conflicts with others, caring for their offspring, greeting, playing with their children, sitting by an alliance (have you pulled out your hair over your daughter/son’s angst about who sat next to whom in the school lunchroom? ; it’s all here! ), sharing food, and more. Grooming means actual pruning of another’s coat, cleaning it, which releases endorphins in the brain in humans, and I’ll wager in chimpanzees, too. One of the most fascinating things that holds true here, and in my work with humans, is the social value of interaction. Yes, it’s important who grooms whom, but it can be even more important who sees it, and what happened beforehand and what happened afterward. Yes, and like humans, chimpanzees hold grudges and “settle scores” about wrongs committed hours or days beforehand. They throw tantrums, too. In the third chapter, Restless Stability, de Waal discusses the networked relationships among community members, and how these affected the community’s stability. He points out that hierarchy is a valuable lens through which to study primate communities, but so is networked structures, which are more flat. Sexual Privileges details how various aspects of courtship and mating happen for various community members, largely affected by their status. Chapter Five, Social Mechanisms is arguably where the most practical takeaways are found. It discusses Dependent Rank, Female Hierarchy, Strategic Intelligence, Differences Between the Sexes, Sharing and Reciprocity and illustrates each with examples of characters’ behavior. Formalization: positions and ranks are formalized, and struggle happens when ranks become uncertain. This also involves very formal recognition of changes in ranks, which is done using the social actions I mention above. Influence is nuanced; one’s social position, age, personality, connections and experience all factor in. Mama always had very high influence in the community, as did Yeroen even after he’d been deposed. Every member in the community can “pull strings” and ask for help in getting things done. Members ask for help in punishing other members; it’s amazing. Coalitions are agreements to help each other in conflicts; they are made between males, females and males/females. Balance among males. Although they are clearly rivals, males build strong relationships among each other, although we witness shifts in the whole configuration. Currency here is grooming, greeting (paying respect by bowing) and reconciliations after fights. Stability: the females’ relationships are less hierarchal and more stable than the males’. Female often mediate between males in conflict. Exchanges: Chimpanzees exchange social favors to curry favor with others, and these are very nuanced because they are necessarily conditional. For example, coalition partners support each other in general, but not when issues arise in which they don’t agree. Manipulation: chimpanzees are very sophisticated at manipulating others to get what they want. Rational strategies: Although not “proven,” evidence suggests that chimpanzees plan their strategies significantly in advance of carrying them out. Privileges: higher status means more mating. I find that Chimpanzee Politics enables rare insight into human behavior precisely because the behavior is so recognizable and easy to see, especially since it is not human behavior. Humans don’t like to admit they act this way. It’s a magic mirror to understand, not only generalities about human behavior, but specific social mechanisms and how they work. The book is also highly entertaining, so a rare work. More subjectively, I love the book because it enables me to appreciate primate behavior that’s so prevalent everywhere I look. Knowing that this behavior is in our DNA enables me to accept it at a new level, to be more understanding. That allows me to change my view and expectations of others’ behaviors. And I get another level of value because I can use the insight to help my teams and clients in their behaviors. Anyone in “management” will probably find it similarly useful. If you care to understand “politics” at a much deeper level, I think you’ll find this book immensely valuable and refreshing. I think much of the bitterness many people have about human politics is founded on huge expectation gaps, the rife over-promising and under-delivering. You can reframe your relationship to politics by lowering your expectations without bitterness: in my case, once I understand that it’s in our DNA to be self-serving, to make promises to curry favor that may be only applicable under certain conditions, I can be more graceful about the whole thing. And more astute when considering politicians’ social actions. At a more metaphysical level, this book gives me immense pleasure because many things that most people think are unique to humans are not at all, chimpanzees and other primates exhibit behaviors that feel profoundly human. So it’s beautiful to see humans in context, to realize that we aren’t so special. Ostensibly, that helps us “get over ourselves,” to be more humble and open. Also see my reviews of Bonobo Handshake as well as Robin Dunbar’s brilliant book, Grooming, Gossip and the Evolution of Language for more insights about evolutionary underpinnings of human social behavior.